Born the son of a prominent lawyer in the seaport of Nantes, Verne was raised with expectations of becoming a lawyer himself. 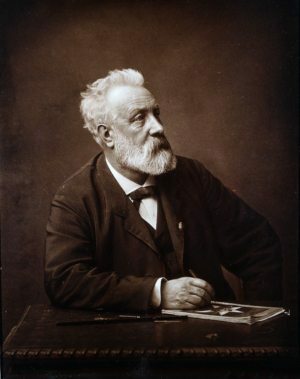 While studying law in Paris in 1849, however, Verne became involved in the local theatre and soon accepted the position of Secretary of the Theatre Lyrique, turning down an offer from his father to take over the family law practice. In 1851, prompted by entry requirements into a competition in the periodical Musee des families, Verne published his first short historical adventure story, A Voyage in a Balloon. Inspired by the style of James Fenimore Cooper, the narrative structure of this fast-paced adventure tale would inform Verne’s future works in addition to the content of the travel accounts of notable French explorers Verne was known to spend hours studying in the Bibliotheque Nationale de France. In 1862, Verne met publisher Pierre-Jules Hetzel (publisher of works by Honore de Balzac and Victor Hugo) who offered him a long-term contract to write for his recently launched Magisin d’Education et de Recreation. 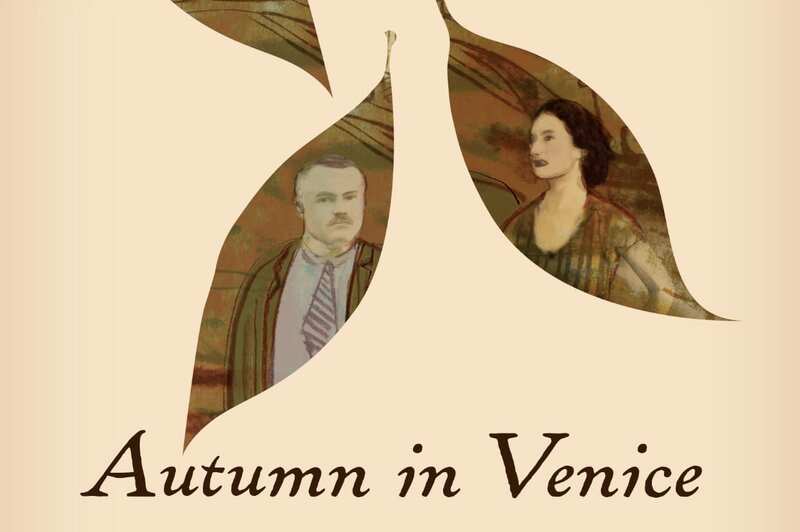 The majority of Verne’s works would, from that point on, be published by Hetzel in his Magasin before being published in book form. 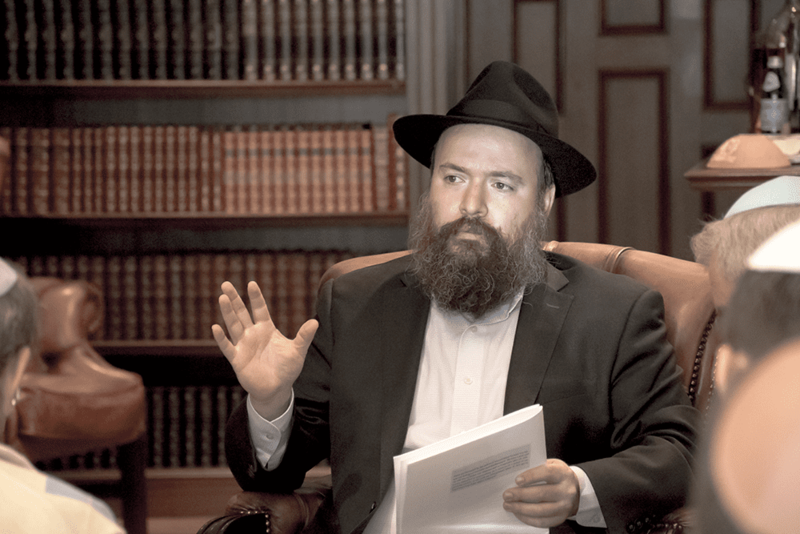 Hetzel boasted that Verne’s works would become a novel sequence encompassing the entirety of current geographical, geological, and astronomical knowledge. 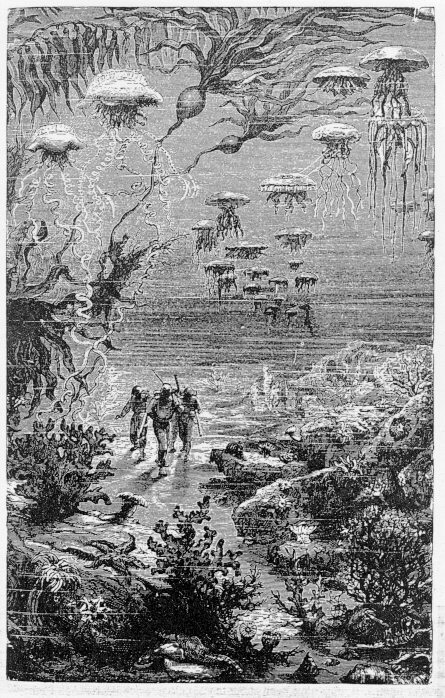 Voyages Extraordinaires soon came to include some of Verne’s most well-known works including: Journey to the Center of the Earth, From the Earth to the Moon, Around the World in Eighty Days, and Twenty Thousand Leagues Under the Sea. 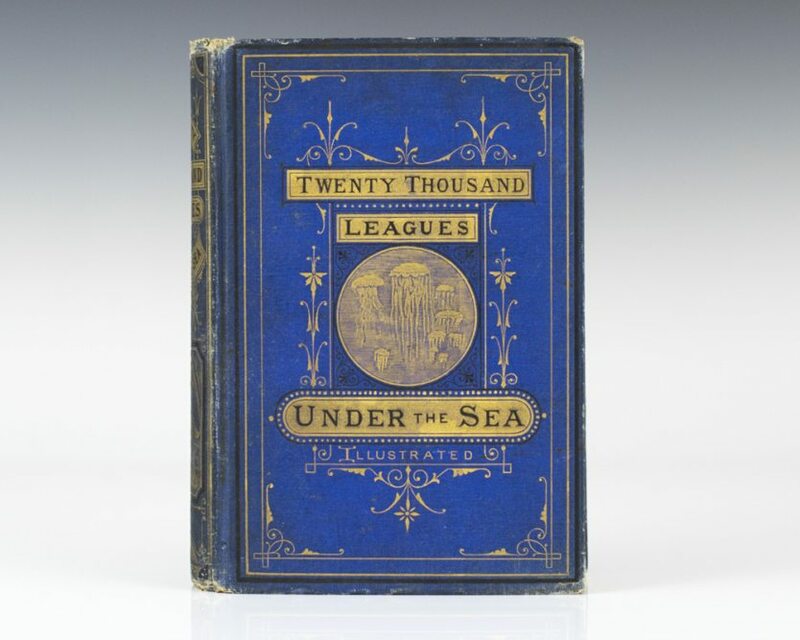 Originally published in 1869 in Hetzel’s Magasin, Twenty Thousand Leagues Under the Sea received such overwhelmingly positive reception that is was soon published in a deluxe illustrated edition including 11 illustrations by Alphonse de Neuville and Edouard Riou and made Verne one of the most-translated authors in the world. Twenty Thousand Leagues Under the Sea told the tale of the plight of Captain Nemo as he roamed the depths of the ocean in his futuristic, electric-powered submarine, the Nautilus, with three accidental companions. Nemo’s name was an allusion to Homer’s Odysseus (who once referred to himself as ‘Nobody’), the entire tale an allegory of the classic epic journey; of a man alienated from his home yet longing to return to it. Nemo and his companions circle the globe and encounter both fantastic and historical enchantments like the corals of the Red Sea, the Transatlantic telegraph cable, and the city of Atlantis, all of which are vividly described and illustrated. Their journey is not without hazards and misfortunes, however, including an attack on the Nautilus by a school of giant cuttlefish and a tragic counterattack on another ship which results in death and disenchantment. Not only was Verne’s Nautilus far more technologically advanced than any submarines of the time, its mechanisms were practically a prediction of the way submarines would come to be constructed and operate in the future. Other innovations like the underwater breathing apparatuses worn by Nemo’s divers proved to be similarly predictive. Although Verne later dismissed these predictions as mere coincidence, they earned him a reputation of near prophet in many circles, so much so that both the first all-electric and nuclear-powered submarines were named Nautilus in his honor. 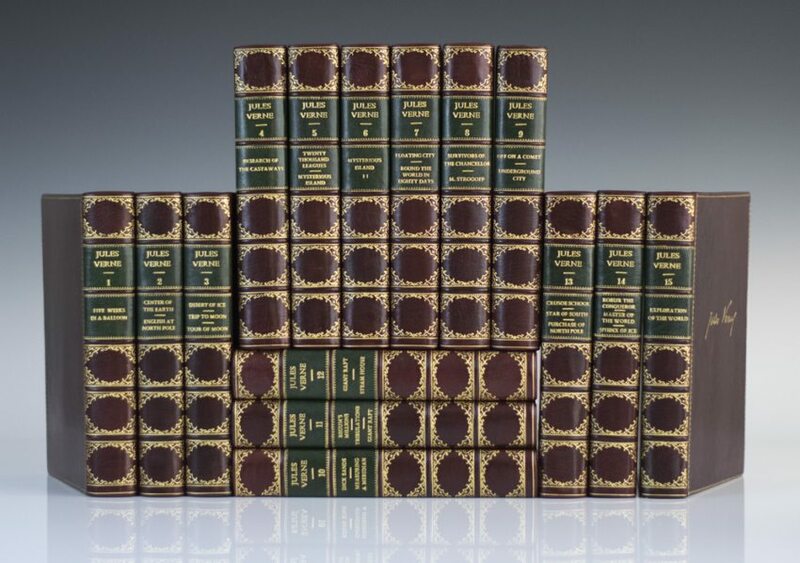 Our collection also includes a finely bound limited edition set of The Works of Jules Verne with illustrated volumes of Twenty Thousand Leagues Under the Sea, Journey to the Center of the Earth, The Mysterious Island, Around the World in Eighty Days, and one of Verne’s last novels The Master of the World.